As a marketer, I’m always impressed when a brand is able to target me and move me through their funnel to the point of conversion. Having an in-depth knowledge of marketing, I’ve often avoided marketing campaigns because I know the strategies and tactics they’re employing on me, and I’m often critical of their execution (or feel like I’m being manipulated into purchasing). In this article, I want to highlight what the brand Ritual, who converted me on one of their products in less than ten minutes. I’ll share what they did right, and what we as marketers can learn from the case study. 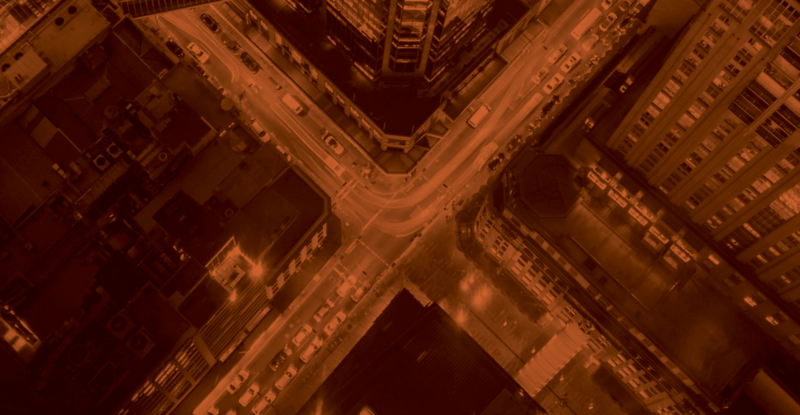 In our previous eCom in the Wild series, we looked at how brands are Solving the Size Problem. The product is a multivitamin that’s specifically formulated for women. 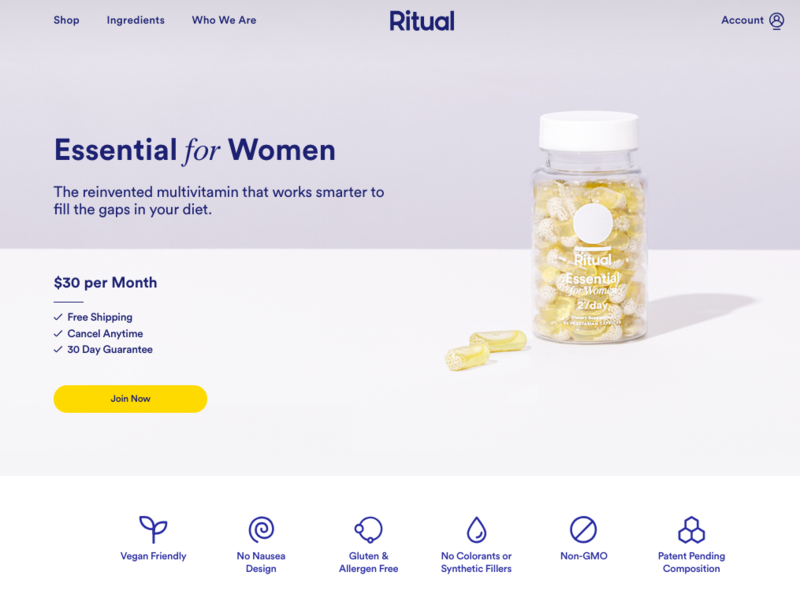 This is Ritual’s first and only product that features nine ingredients and focuses on the research behind their multivitamin and transparency with their vendors. Ritual Essentials is subscription based and is $30 a month recurring (although you are able to skip months or cancel anytime). 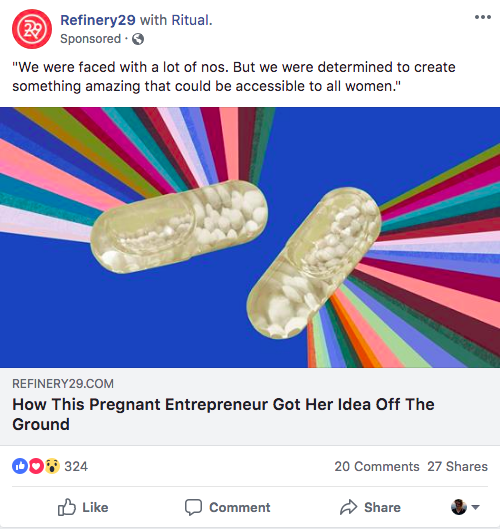 Ritual found me through a Facebook targeted campaign that caught my attention. The previous night, I had been doing research on natural supplements and even purchased a couple from Amazon. The morning that I saw the campaign, I thought that it would be a good idea to try and find a multivitamin to start taking along with my supplements. Within hours of that thought, this advertisement appeared on my Facebook feed. 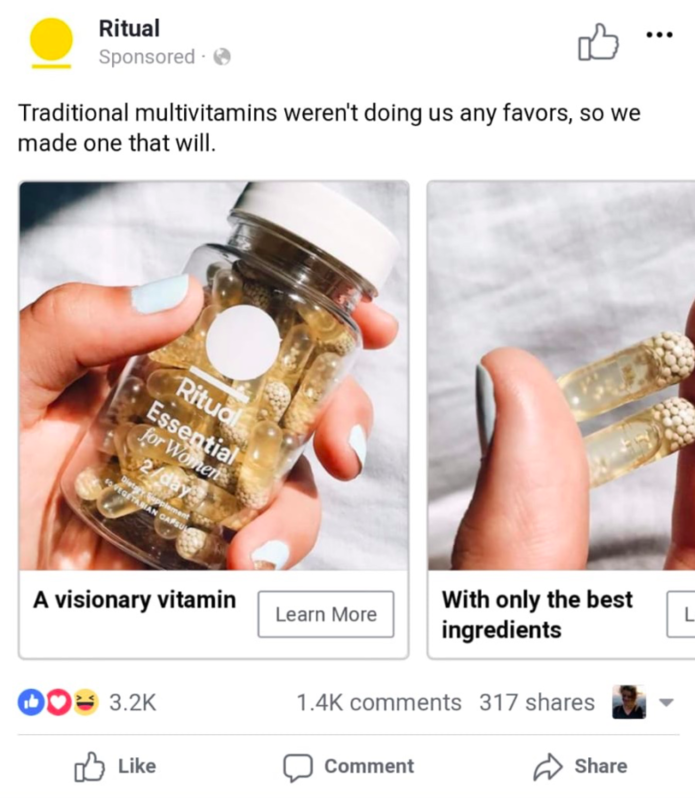 The visual imagery caught my eye because the product looks very unique for a vitamin. It’s aesthetically pleasing and they captured it visually similar to what I’ve come to expect from a Buzzfeed video. What did Ritual do right within this first ad? Ritual’s marketing and brand messaging (which we’ll address in more detail later) is research heavy which is why they’re likely appealing to college graduates. To grab someone’s attention in their news feed you have to have compelling imagery and video, especially when people are trained to ignore advertisements. 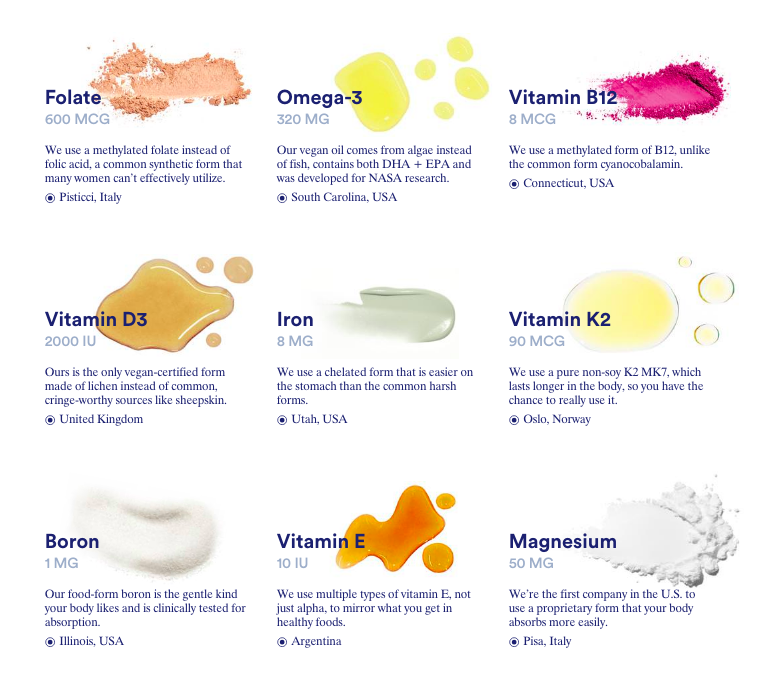 What caught my attention in this ad, is how cool the vitamin looked. Between the product and the coloring of the background and text, I initially thought I was looking at a Buzzstream article. That initial attention-grab gave me enough curiosity to then click on the website and see what the product was about. By pulling in these references, it appeases some doubt that you’re being spammed by an ad, through social proof and gives you enough trust to look at the product a little further. After I clicked on the advertisement, it brought me to Ritual’s website. I was intrigued by the product and wanted to learn more. Through my time on the site, Ritual was able to move me through the funnel, to the point of conversion. When I clicked on the site, I was pleased by the information I found around the product. Their main product page contained the components listed below. At the top of the page, Ritual highlights the top selling points in an easy to digest format. 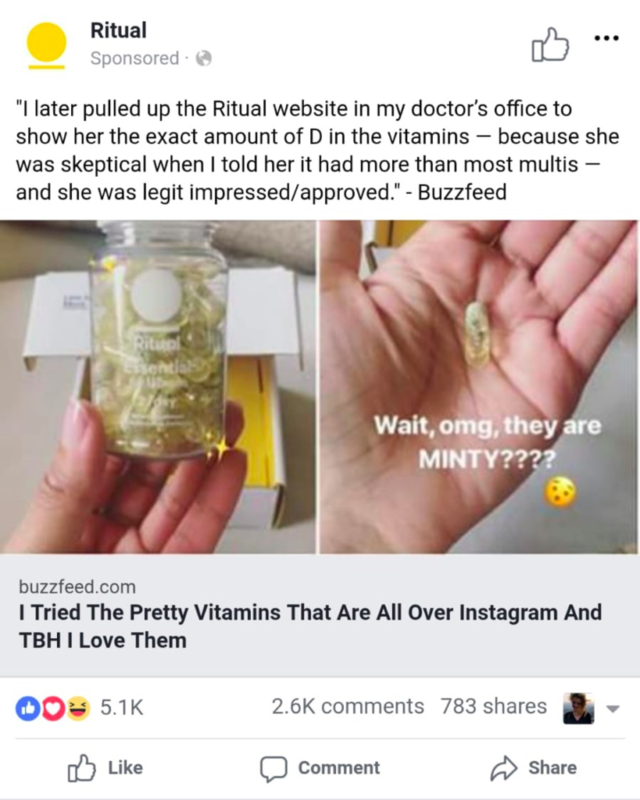 These specific highlights callout the product components that are most talked about in our culture, or are common problems with multi-vitamins that are addressed within Ritual’s product. Featuring this information works to put prospective buyers at ease, to feel like they’re consuming something healthy for them. 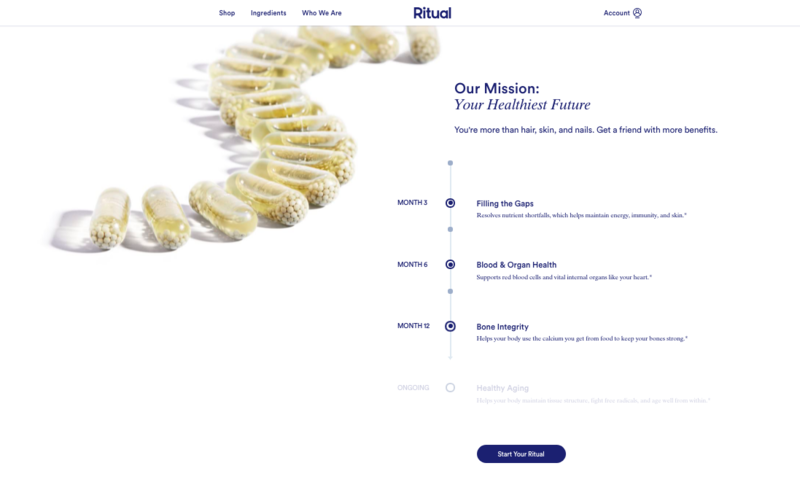 The next component that Ritual includes on their product page is their mission statement, ‘Your Healthiest Future’ which leads into their claims of the long-term benefits of taking the vitamin over the course of a year. This section could be improved by citing any research that proves the benefits they are claiming. However, they do a good job with how the information is displayed and sharing long-term benefits. Not only is this good for the audience, but it also is a valuable tactic for encouraging customer longevity. This section was the most compelling to me, based on the information that I needed to convert. I wanted to ensure that my multivitamin was absorbable, ethically sourced, and pure ingredients. This section was one that provided all of the information that I needed to want to buy. Ritual included what ingredients are included, where they’re sourced, the dosage, and supporting information. They’ve also taken the time to display the information in an aesthetically pleasing way with both images of the ingredients and short information that’s easy to scan. Overall, one of the aspects that make this brand so compelling is their storytelling around their product. They did this through their onsite copy, but it’s best shown in the video below. 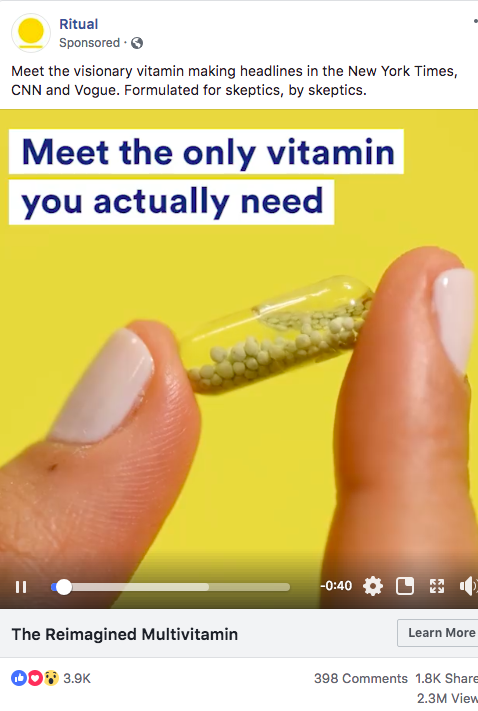 In this video, they tap into a lot of frustrations that both women and people feel that extend beyond just a vitamin and health, but common experience in life. The challenges of being a woman in the workforce and balancing having a family and pursuing a dream. The desire for accurate information on health and what we’re putting in our bodies. Feeling like we’re not being manipulated by people who are trying to sell us something that’s overall harmful to us. All of these areas create a mission to go behind. 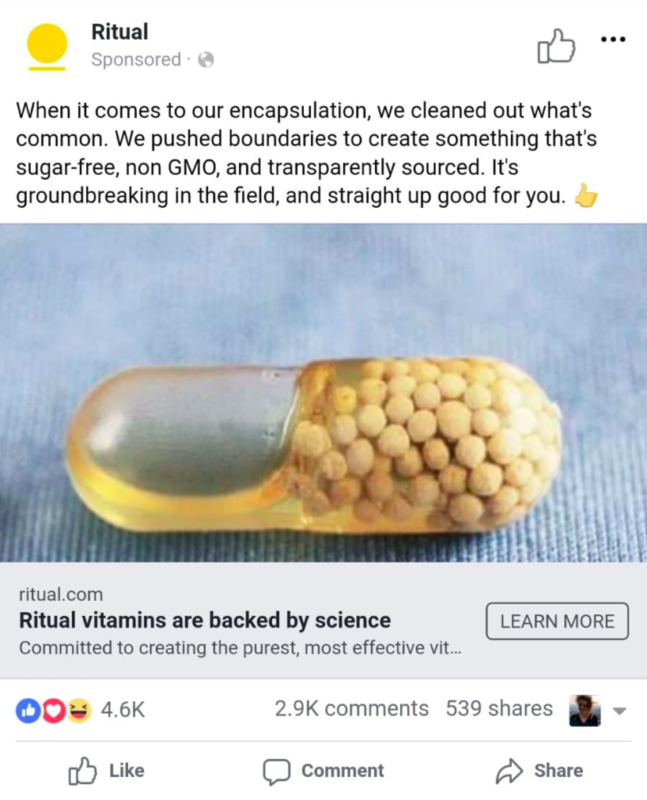 By consuming Ritual’s vitamins your not only doing something that’s good for you and your overall health, but you’re supporting women, helping people pursue their dreams, and empowering a product that is good for you. You’ll see throughout Ritual’s ads that they leverage these themes: science and passion to help inspire customers. These two ideas are a fantastic duo that helps you through the conversion process and make you feel good about being apart of their mission. Although Ritual does a great job overall, there are a few areas that they could improve upon or consider for either branding or improving efficiencies. Ritual does not stop ads after the point of conversion, which in this case is a strong inefficiency. 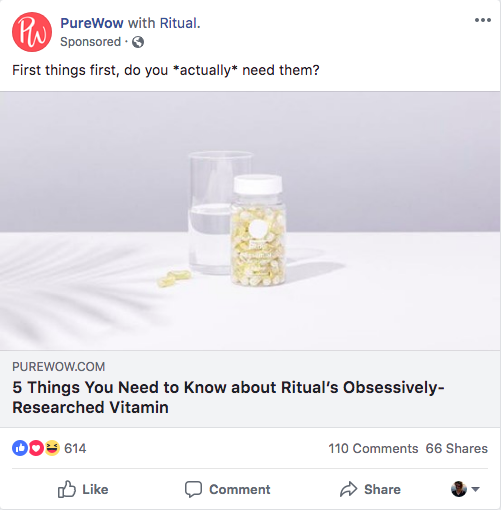 Because Ritual’s conversion is a subscription model, and they only sell this one product, there is no opportunity for additional conversions, upsells, or cross-sells. By excluding recent converters to their campaigns, they could save substantial money in ad spend. Finally, one area that was controversial for Ritual was their brand messaging in their video that might suggest male shaming. 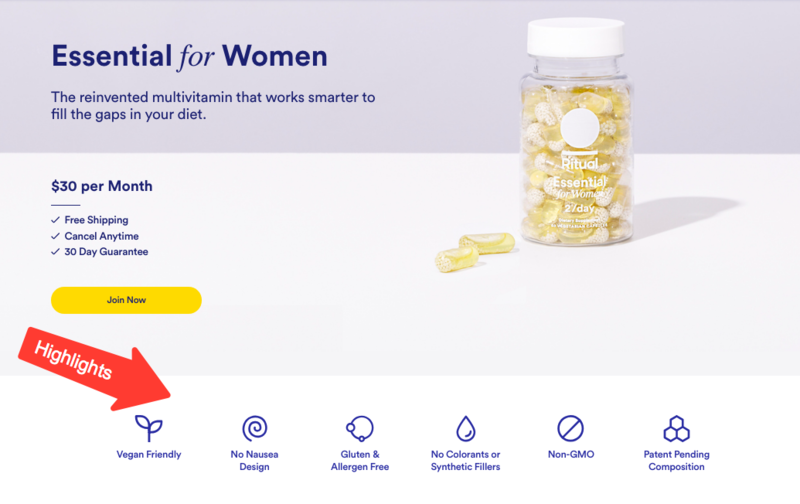 They imply that older white males are responsible for the quality of vitamins that are available to women today. Within the comments section, many potential customers were dissuaded from conversion based on these implications. Overall, Ritual has done an incredible job at marketing to their target audience, and moving users through the funnel to converting. Within their campaigns, there is a lot of learning opportunities for many brands in content marketing, branding, and their advertisement. I’m excited to continue to follow Ritual’s progress and see how they expand into new products in the future.